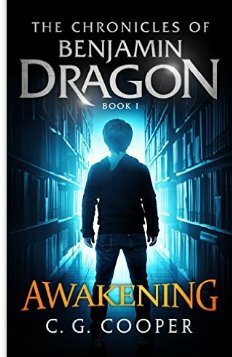 Ten year old Benjamin Dragon is a very bright child who has already skipped two years in school. He is the son of Tanya and Timothy Dragon, a powerful lawyer and businessman. Their frequent moves plus Benjamin’s small statue and last name provide fertile ground for bullies. On the first day of a new school Benjamin is bullied on the playground. Egging him on to fight, Nathan lies on the ground bloodied and injured. But Benjamin is puzzled because he never even touched the boy. When his parents urge him to go to the hospital to apologize, Benjamin discovers that he and Nathan have a lot in common. They become good friends, but Nathan is just as puzzled about what happened. When Benjamin is at the scene of a close-call car crash, and the car swerves away to avoid hitting a young girl, Benjamin begins to suspect he had something to do with it. Weird things begin happening. Benjamin swears Nathan to secrecy. A strange old man named Kennedy pays a visit to Benjamin and explains that there are certain special people in the world. Some have the gift of healing, some the gift of growing, and others the gift of destruction, which roughly translates to telekinesis. He informs Benjamin that he will be trained in his gifts. Benjamin is scared, but he is elated that he will be attending Camp Walamalican with his friends Nathan and Aaron. There he meets another gifted one named Wally who is a healer. On the other hand, Benjamin will come face to face with a destructor who threatens to corrupt him and destroy people that he loves. Will Benjamin learn how to use his powers? How can he adjust to living a normal live, while coping with extraordinary power? Recommended for a middle grade, young adult and adult audience. The characters and plot are well developed. Addresses lots of issues pre teens and teens face like bullying, fitting in with peers, being gifted, and getting along with parents. Look forward to more in the series.